I was fortunate to wake before the sun came up. I was worried I'd oversleep, as I found out last night that my cell phone's alarm clock doesn't function if there is no service available. 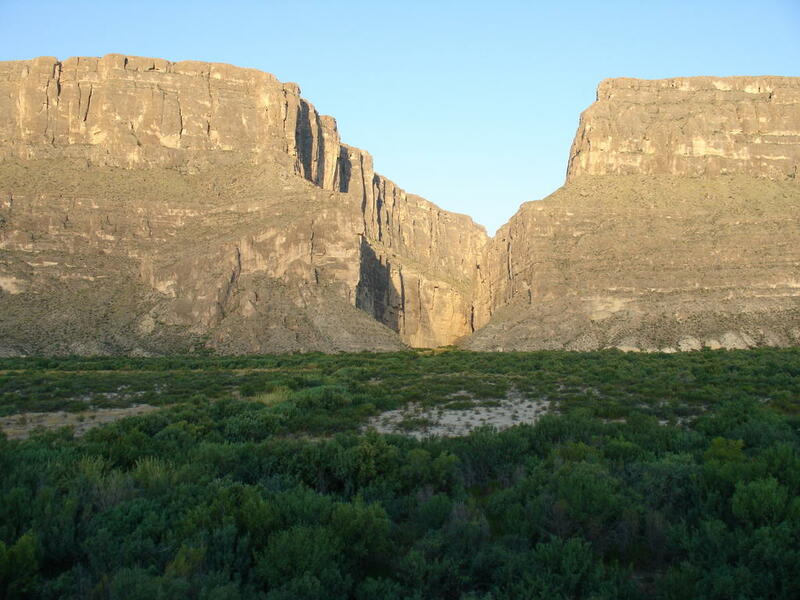 Having loaded up the car, I continued the drive to Santa Elena Canyon. It was impressive from far away, and I was able to get up close. There wasn't much for trails there, however, so I headed back towards the other end of the park. I got out and walked the Chimneys trail which I had passed last night. It was only a 3 mile hike, but I was glad I brought a lot of water. In this dry heat, you don't notice sweating so much, so you have to keep drinking water or you can dehydrate quickly. On the hike I saw all types of cacti and some lizards scurrying about. Speaking of animals, since yesterday I've seen a number of jackrabbits and roadrunners...roadrunners are nothing like the cartoon, but they move pretty quickly across the ground. I decided as nice as this place was, I had to get moving if I wanted to get to New Mexico by evening. I stopped for some gas and ice at Panther Junction (located near the middle of the park) and then headed back North. The original plan was to head towards Guadalupe Mountains National Park, which sits on part of the border of Texas and New Mexico. I changed my mind and decided I would rather head towards Socorro, NM. In case you don't know, about 50 miles west of Socorro is one of the world's largest radio observatories, the Very Large Array (VLA). It is made up of 27 individual huge radio telescopes (they look like giant satellite dishes) that can work together, using a process call inferometry, to detect radio waves from space. The VLA was made famous when part of the movie "Contact," based on Carl Sagan's book of the same name, was filmed here. I was always impressed by the size of this place, but I had no idea how big it was until I saw it for myself. The individual telescopes are set on little railroad tracks in a "Y" shape, so they can be moved around into different positions easily. If the radio astronomers need to focus on a specific area in space, they spread the dishes out wider. If they need a broader focus, than they move the dishes closer together. Fortunately for me, the visitor center was open until sunset, so I got in and took the self-guided tour. The tour takes you close to only one of the dishes, but I got a good sense of how huge these things were. The dish is actually twice the size of the average American home. I was surprised to find that there was no mention of the filming of "Contact" here until I saw a barely noticeable display on a wall headed out of the visitor center. My guess is the VLA wanted to distance itself from the idea that it listens for signals from "little green men," which is how it is used in the film. The VLA is actually used to understand the make up of stars, galaxies, black holes...that type of thing, and it can measure radiation still present in the Universe from the Big Bang. The organization that looks for signals from other civilizations, SETI (Search for Extra-Terrestial Intelligence), scans a very narrow band of the radio spectrum. 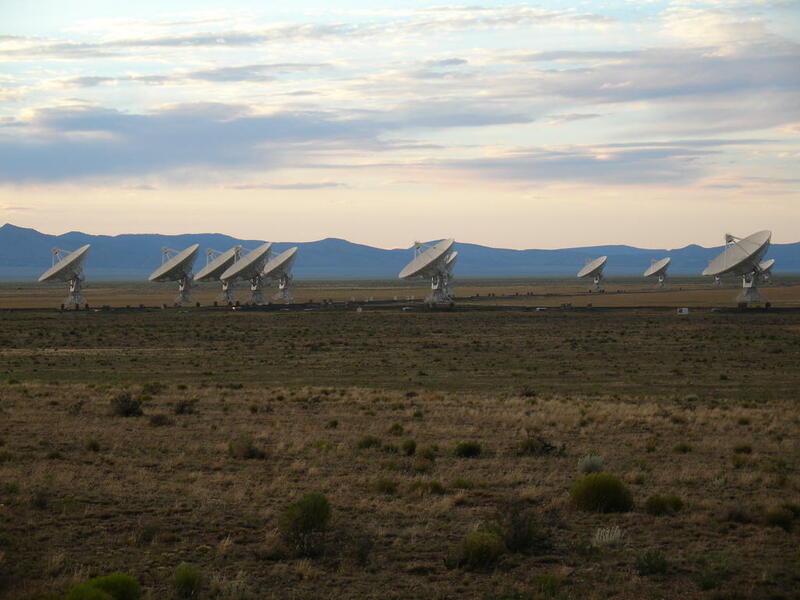 So although the film would have you believe otherwise, the VLA wouldn't be useful to SETI as it can't focus its radio telescopes to that narrow band. Anyhow, I left the VLA at sunset. I was in the middle of nowhere, having driven near 800 miles for the day, and I wanted to relax and find a hotel for the first time this trip. However, the nearest town of any size was 60 miles away. So I continued west towards Springerville, AZ. It wasn't the easiest of drives, as I had about 3 deer run in front of me, and I couldn't avoid running over a jackrabbit. 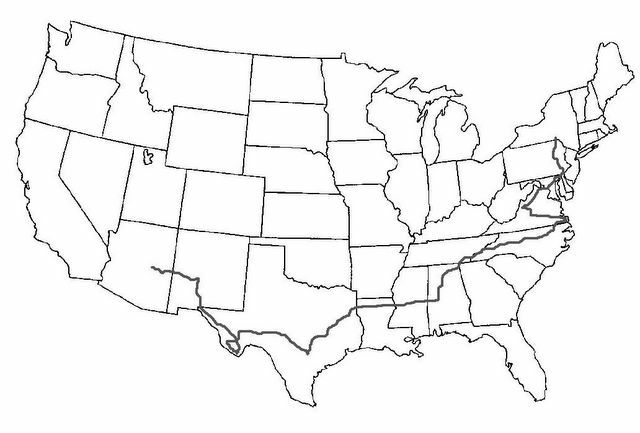 But I did cross the Continental Divide in that same drive. Ironically, the town of Springerville was having some kind of American Legion convention, so all their hotels/motels were booked. Frustrated, I continued further west about 40 miles to Show Low, where I eventually found a Holiday Inn. I'll take it easy tomorrow - I'll sleep in, and then I'll eventually head South towards Tuscon, to Saguaro National Park. If all goes as planned, I'll be in California by tomorrow. I left Jon's apartment around 8 this morning as the goad was to get to Big Bend National Park before dark. 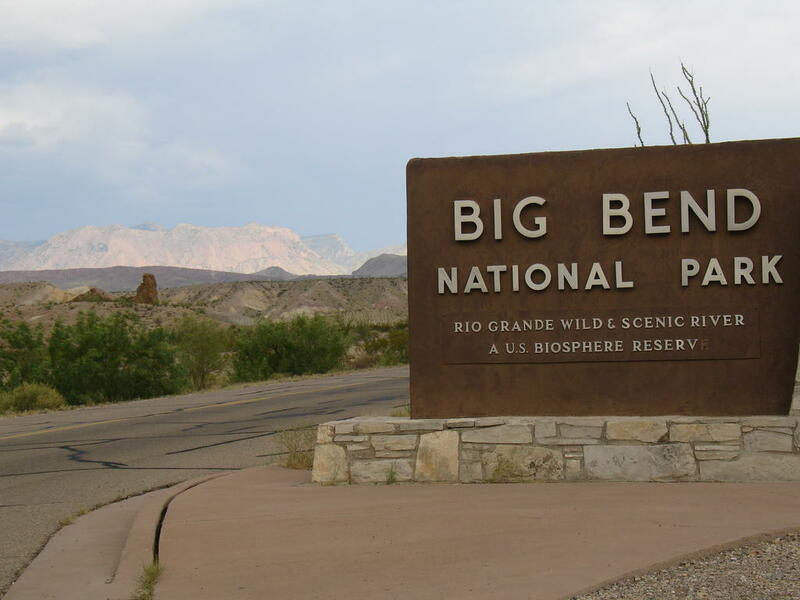 In case you don't know where Big Bend is...find El Paso at the western tip of Texas...then head south along the border with Mexico, and where the border makes a "U" shape is the park - hence "Big Bend." The best way to get there was to head south towards San Antonio, and then catch I10 West all the way to Fort Stockton, which would be quite a haul, and the follow a highway into the park 150 miles south. It would be a full day of driving altogether. I finally arrived in Fort Stockton around 3pm (or 4...I keep forgetting to change the time on my car radio). I begin to head south towards the park, but I saw heavy storm clouds ahead along with some lightning, so I began to get discouraged. And I was still about 100 miles away. 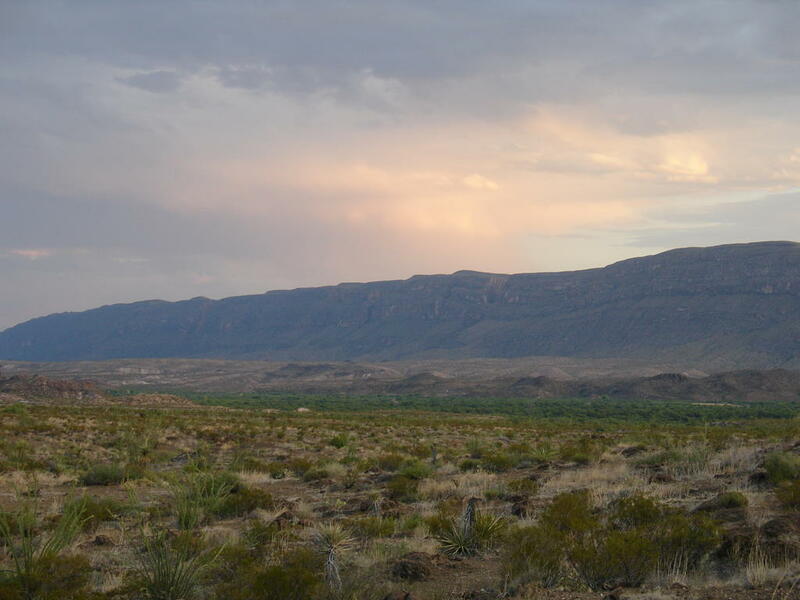 I decided I didn't want to get there, near sunset, in the rain, so I chose to head North and try to get to the Guadalupe Mountains (on the TX/NM border). I got a little antsy and began to drive too fast on the two-lane highway that would eventually take me back North. On this highway, there were no posted speed limits, and rarely would you pass any cars. My foolishness caught up with me and I was noticed by a patrolman who subsequently pulled me over. As odd as this may sound, if it were not for me being pulled over, my day wouldn't have turned out nearly as great as it did. Officer Graham: "Mr. Curtin, are you in college?" Me: "Just recently graduated, Sir." Officer Graham: "What was your major?" Officer Graham: "See if you can manage to go a little slower." I didn't laugh right then, but I thought that was so very clever. He was extremely friendly and courteous, and he asked about my plans. I told him of my decision to skip Big Bend, but he said it's something that shouldn't be missed, and he didn't think the weater was bad there. He actually volunteered to use his radio to find out the conditions at the Park...he got back to me and said it should be pretty clear down there, so it would be worthwhile to take the drive. Another route into the park would be coming up shortly at the next town, and he recommended I use that highway. I arrived in the next town, Alpine, got some gas, and headed South towards the park. It was an incredible drive...hills and mountains along a winding road...it took me a while to actually get to the park because I kept pulling over to take pictures. Spectacular views were hidden just around corners, and you'd have no idea what would be coming up around these turns. It was gorgeous, but nothing compared to when I actually arrived at Big Bend. Pictures don't do this place justice - I have never seen anything like this, and I was awe struck, fortunate enough to see this place at sunset, with just a few clouds in the sky. Hopefully the pictures give you some idea of the beauty and size of this place, but you'd really have to be here to understand, I think. I actually wish I could post more than a few - I took near 140 pictures from the entrance of the park to only 15 miles in. 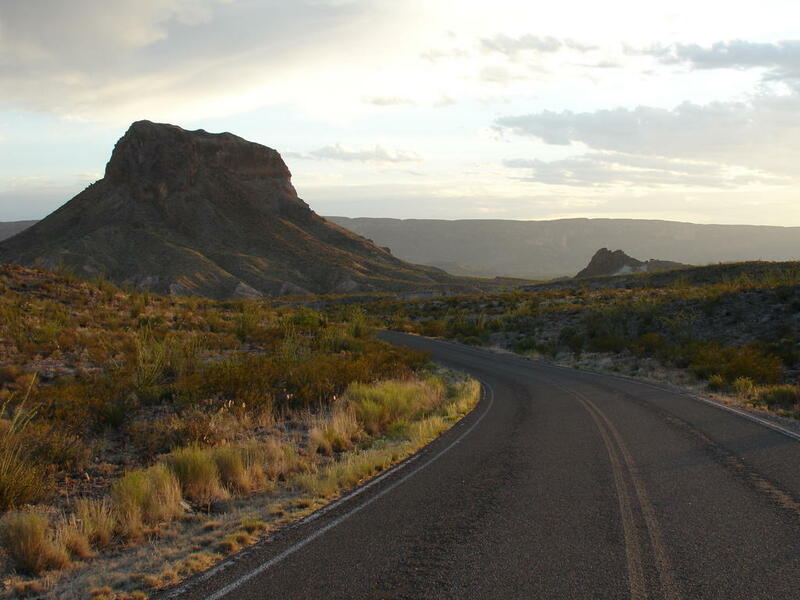 As I mentioned, Big Bend is an enormous park, with a couple roads running through it. 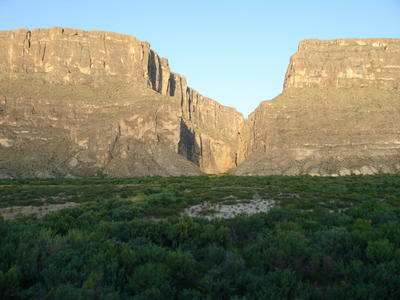 I followed a major route towards the Santa Elena canyon while the sun was going down. Before the canyon, I noticed a sign for a public campground. I decided I'd better pitch tent for the night before it gets dark, and then I'd have the morning to do a little hiking. 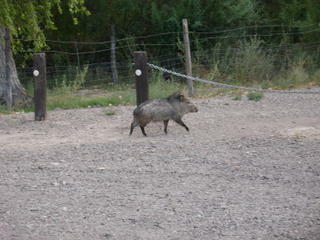 Near the campground I saw some javelinas which I had read about in my guide book. 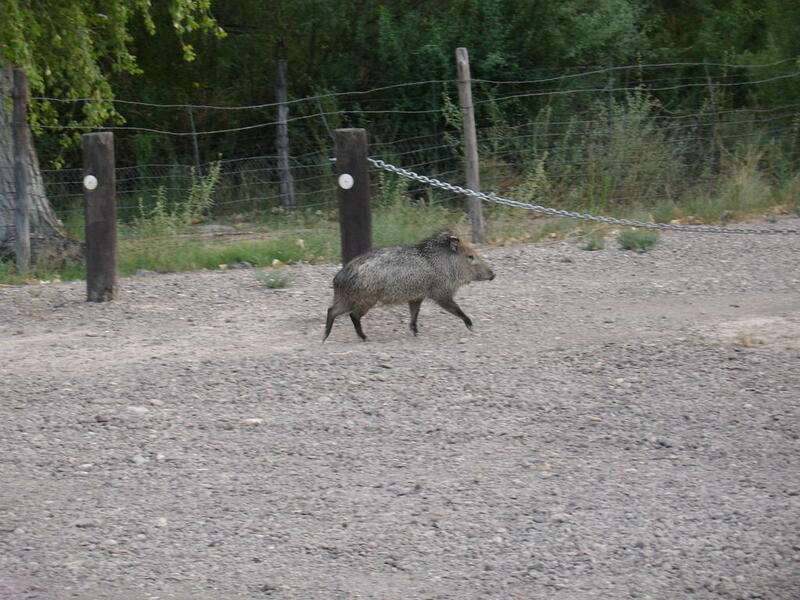 Javelinas are pig-like animals that are common in this region. There are a lot of signs warning visitors to leave food locked in their cars, as javelinas have been known to tear down tents when they get hungry and smell something. No worries here, my granola bars and Honey Combs are stowed safely in my backseat. The campground here is run on an honor code - every night you stay costs $10 - you leave your check or cash in an envelope and drop it off in a secure box. I definitely couldn't argue with that price, especially since the quality of this campground was far above and beyond that of River Valley in NC. Oddly enough, I was the only one in the entire campground. It was great having the whole place to myself. I got the tent set up while it was still light out (not that it takes a lot of time, anyway) and was able to watch the moon and Venus set, and the stars come out. There's no artificial light here (other than from my flashlight), so I've never seen as many stars. The campground is near the canyon wall, as well...all in all, a pretty nice place to spend the night. So as you can see, if I never got pulled over I never would have seen this great place. Odd how things work like that.